I realized that I’ve been saying some mean things about winter lately. And we’ve had such a pleasant winter, so far! The truth is, I kinda like winter (in the way that a person who was probably a hibernating animal in another life likes winter!) I’d like to stay home all day, cuddled up, reading books, the boys in their pjs, me making complicated baked goods and slow-cooked I-don’t-know-whats! But I work on the weekends, so we never have a day of everyone in their pjs. Here’s something you can make that’s warm and rich and has complex flavors, so it feels like that kind of day, but in a fraction of the time. Oh, yes, and I almost forgot! We ate it with home-made tortilla chips and some grated cheese. Nice. Here’s Bryon Lee and the Dragonaire’s with Hot Hot Hot. Warm the olive oil in a large soup pan. Add the shallot, garlic, basil sage and oregano. Cook till the shallot and garlic start to brown. Add the cauliflower, and cook till that starts to brown. Then add the tomato paste, kidney beans and black beans. Cook for a bit, then add the tomatoes, paprika, chipotle. Add water to cover everything by about 1/2 inch. Add the cinnamon stick and bay leaf. Bring to a boil, reduce heat, simmer for 15 minutes or so, till the cauliflower is soft. Add the sugar and couscous. Cook for 5 more minutes. Add the vinegar, salt and pepper. Taste for balance of flavors. Serve with grated sharp cheese and tortilla chips. And hot sauce, if you have it! And cilantro, if you like it!! To make the tortilla chips. Take a big flour tortilla, brush on both sides with olive oil. Sprinkle the top with coarsely ground sea salt and tons of pepper. Toast in your toaster oven or broil in your real oven till browned and crispy. With a pizza wheel or a sharp knife, cut into nice-sized pieces. Leave to cool on a rack till super crispy. 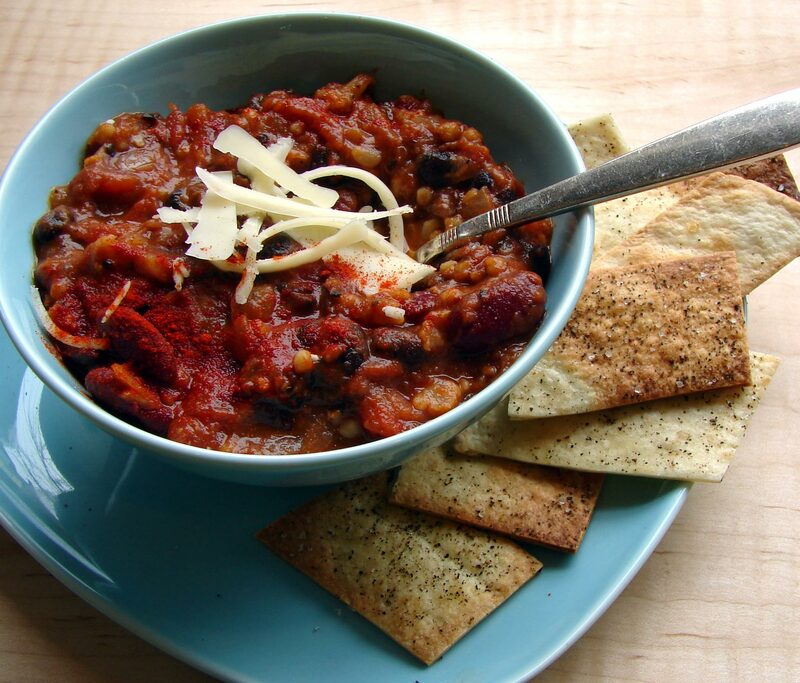 This entry was posted in beans, recipe, tomatoes, Uncategorized and tagged black beans, cauliflower, chipotle, kidney beans, vegan chili, vegetarian chili by Claire. Bookmark the permalink. That is such a nice looking dish, wish you could post the real thing instead of a just a photo, it looks so tempting. It’s about that time of year when seed catalogues start to arrive, I know that you like peppers and eggplants and there’s a nursery in NJ that specialises in both of these, it’s Cross Country Nursery at chile plants.com and another great catalogue is Baker Creek Heirloom Seeds at http://www.rareseeds.com, ask them for their catalog, you’ll enjoy it. Hello, Tony! Cross Country Nursery is very close to us! 2 minutes from David’s shop. We go there every spring. It’s remarkable. Almost overwhelming, really, but so much fun. We get more tomato plants than we can fit in our small garden, and Isaac and Malcolm usually pick out a pepper plant each to take care of. Plus basil, eggplants, cilantro. Thanks for your kind words! And I’ll look up Baker Creek as well. I think you’d like Cross Country. They have some big beautiful dogs that roam around the farm, and beautiful birds singing in all the trees – warblers and orioles (it’s always spring when we go). We found a turtle on the road once, on the way there, and they let us release it in a fenced-in forested area behind the farm. Very nice people! They specialize in VERY hot peppers, actually the hottest in the world. I have 6 plants from them in my atrium right now on heater pads and under lights, they’re very healthy and I’m planning to create a small greenhouse outdoors for them, ideally they like HOT Indian climate. I was amazed at how well they packaged the plants for shipping and how well they travelled; I’ve spoken with Cross Country a few times and they’ve been very helpful and friendly. Be sure to get the Baker Creek catalog, it’s quite amazing, you’ll enjoy just having it.